2016-05-24 Yesterday when I picked up the grand-kids (Millie and Elijah), from school, Millie (1st grade) handed me the sketch at right. I'm sure for the teacher it was about handwriting. But for me it was a reminder that we should do things like hiking and camping, at least in part, to spend time with our families. Our investment in time, doing fun and perhaps unusual, special or even uncomfortable things with them will influence them and their attitudes toward life and others for a lifetime. The event itself will too quickly fade into a distant memory. But the subtle ways in which we face the challenges and respond to the joys make a difference. Reminds me of the Apostle Paul's comments to his friends in Rome that he longed to be with them so they could be of mutual encouragement in their lives with and for God. (Romans 1:11,12) Hiking and camping are times when we can help each other, serve each other, calm each other's fears and as Jesus said, love each other under less than ideal circumstances. Millie's first grade paper, just for me! 2016-05-20 Today Sharon and I went for a two mile hike on the Seno Woodland Trail. We arrived about 10:30 and hiked until about 12:30, including a hot meal cooked on the trail! ​It was an absolutely beautiful day with temperatures near 70, clear sunny skies and a light breeze. The kind of day we had sort of forgotten was possible here in southeast Wisconsin. We had a great time, just being together in a really pretty wooded place. Except for in the low wooded areas, the mosquitoes were not bad. Click here for a map of this hike. 2016-05-16 Just a short distance from our home on the west side of County Road P is place we've driven by many times and each time I wonder what it is. The sign out front says, "Seno Woodland Trail." It kind of looks like private property but then has a parking area. So a few days ago I stopped by to see what I could learn about it. There was a large mail box near a sign marked Trail Head that contained some maps and booklets. Then I looked it up on my All Trails app on my phone. Clearly the trail(s) are open to the public. So Yesterday I decided to go investigate further by walking some of the trails. ​I arrived there around 11:30am and was back at the car about 2:00pm after an enjoyable just over two mile walk through both wooded and open areas, ridges and valleys. ​Click here for a map of the hike. Dr. Elvira Seno who built a tree farm there. The story is told on their website. If you are looking for a very accessible and relatively easy place to hike, give it a try. 2016-05-07 Yesterday afternoon, after doing some RC flying in the morning, my wife and I went out to the Richard Bong State Recreation Area for a walk. Before hitting the trail we drove through the Sunrise Camping area and were impressed with the number of sites either already set up or were reserved. Clearly the warmer weather is bringing folks out. 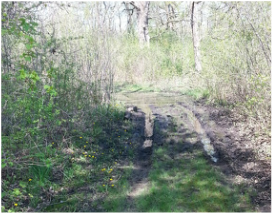 The "worst" of several wet spots along the 2.5 mile red trail north of County Road BB. ​For a map of the hike click here. I had not done any of the trails north of County Road BB so we parked there and did the 2.5 mile red loop trail that starts and ends at parking lot A. It is not a difficult trail. It passes through several wooded areas but is mostly in prairie with only minor inclines and declines. There are a number of small lakes or perhaps more appropriately water holes and quite a few pretty low wetland areas. The trail crosses a number of those. One had water about ankle deep but we were able to skirt it and just get our shoes good and muddy! I assured my wife that muddy, wet shoes were part of the fun but I'm not sure she bought my line! Even so we had a good time. There were many flowering shrubs and plants. The highlight was probably the two foot snake that crossed our trail. It didn't seem particularly dangerous.